Taming and socializing part 2 – parakeet’s out of the cage, what’s next? Your parakeet is out of the cage and looking at you like, “okay, what’s now? Amuse me people!” Some folks recommend taking your parakeet to a small, safe, room and shutting the door for these first interactions – that didn’t work for us, mainly due to the layout of our house, but in the end it was to our benefit, Toby will only hang out in the kitchen, dining room, and living room and I believe that’s because those are the rooms she was first introduced to. If she goes anywhere outside of that zone it’s either because she’s looking for one of us, or she feels like challenging the bird that lives in the bathroom mirror. What also works in our favor on this issue is Toby’s fear, she was very reluctant to go exploring by herself, and wanted absolutely nothing to do with the floor. But, she did expect us to be fully available for his entertainment and security detail. It may go without saying, please don’t leave your parakeet unattended while she’s out of the cage, particularly in these early times. There is no limit to the number of ways a parakeet can hurt himself in your home. I would say this goes double for parakeets with clipped wings, since they don’t have the ability to get themselves out of trouble by flying. We set out to make areas outside of the cage that would be fun to Toby and would be clearly “hers”. We also spent a lot of time working with Toby on flying back and forth to each of us, and practicing stepping up, but felt like time out of the cage should also be at her leisure to enjoy flying and playing. This pursuit began with the acquisition of the Prevue Hendryx Pet Products Parakeet Park Playground – which was only interesting to Toby if we were playing with it too, and was sort of a bust for us, although a perfectly nice product. She might have found it more interesting if her wings were clipped. So, we moved on to the Kaytee EZ Care Activity Center Playground for Small Birds , as it comes out of the box it is wildly inappropriate for a small bird like a parakeet, but as you see below we quickly loaded it up with a ton of perches and toys, it’s very easy to hop around this way. On days that aren’t too hot we keep it in front of our big living room window so they can look outside, which they both enjoy (unless there are crows around). Another window area was created using a Booda Comfy Perch for Birds, Large 36-Inch, Colors Vary and a couple of other small toys that are suspended securely from the ceiling. 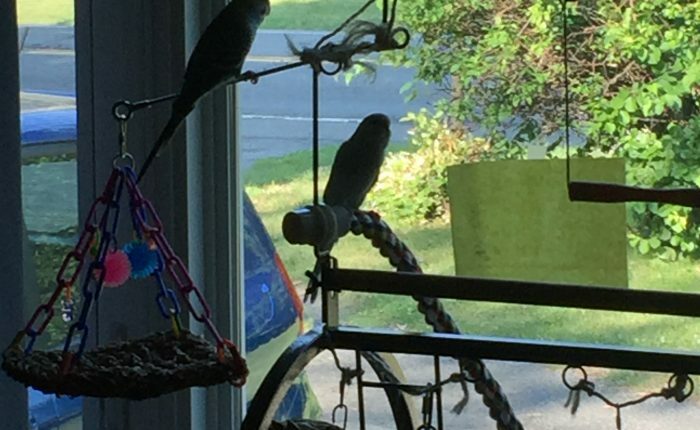 This is another favorite spot of both parakeets. Especially on nice days when the window is open and they can yell at all the outdoor birds. Can you tell we have a ton of comfy perches? Because it takes me a while to learn anything, I bought another table top stand, similar to the Prevue Hendryx Pet Products Big Steps Playground , which was another utter fail. Toby is just as happy if I throw some toys out on the dining room table or couch. A note about using your body as a perch – we were very permissive with Toby initially about where she was allowed to be on our bodies. We were so excited about her not being afraid of anymore that we didn’t want to put any restrictions on Toby at all, and ultimately created a situation where she felt she was the alpha of our flock. I encourage you not to invite your parakeet to sit on your head or to perch on your glasses, even though it’s inarguably adorable. I ended up having an issue with Toby repeatedly trying to “preen” away some broken capillaries on my eyelids and trust me it is not desirable. I’ve become aware that some people have parakeets who are happy to sit with them and watch tv or just chill out, if I ever find out what that’s like I’ll post an update! For now, both of our budgies are in constant motion while they are awake. 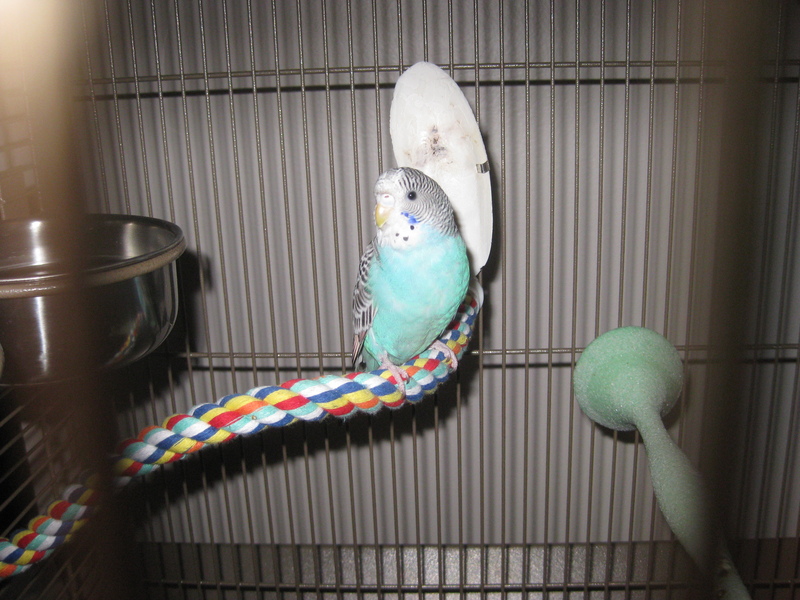 The TL:DR of this post is: once your parakeet is out of the cage keep a very close eye on him and expect to keep him amused, both by working on his skills, and also by having clearly designated areas for him to explore and use for play. Posted on August 2, 2016 April 12, 2017 Categories Our Parakeet Story, Taming and SocializingTags basics, hand taming, new parakeet, socializing, toby, trainingLeave a comment on Taming and socializing part 2 – parakeet’s out of the cage, what’s next? 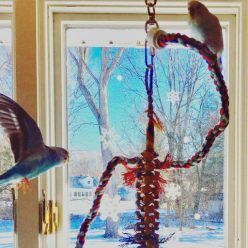 The first day or two after bringing Toby home we were full of conflicting emotions – excitement about finally having a bird and crushing guilt because she was clearly terrified. She came home from a large chain pet store at about 11am on a Saturday, moved into her new cage, and sat in the same place without moving for about 8 hours straight before finally exploring enough to find food and water. Part of the challenge of buying a parakeet that hasn’t been hand fed is that not only does your new parakeet simply not like you; he actually thinks that you are a predator, just because your eyes happen to be on the front of your head (instead of on the sides, where they should be, obviously). In our experience, she is also only accustomed to listening to soft pop, and will have some serious anxiety about television noises for at least a couple of weeks. So, the first goal is to convince your parakeet that you do not intend to kill and eat him. The way to do this is get a nice comfy chair and sit next to your parakeet’s cage for about 30 minutes, as many times as day as you can. Talk to your parakeet so he gets used to the sound of your voice, or sing if you’re so inclined. You’ll know your parakeet is comfortable with your presence near the cage by his body language and behavior. He will be relaxed and will go about his business preening himself, eating, playing etc. The next stage is to show your parakeet your hand, don’t put it in the cage yet, put it near the cage and let him think about it, you may have to do this over a period of several days before your hand stops being alarming. I read a theory somewhere that a parakeet ends up thinking that a human’s face is a bird, and the hands are two additional birds, and that the body is some fantastic moving perch. If you think about it that way, it’s easy to see why the hands would have to be accepted and deemed non-threatening separately from the face and body. Once your parakeet is more comfortable seeing your face and hands you can start putting your hand in the cage, with the Prevue Pet Products 3351COCO Park Plaza Bird Cage, Coco Brown you can easily swing open one of the bowl access doors and use that opening to minimize the risk of your parakeet panicking and ending up outside the cage. Don’t try to touch your parakeet, put your hand somewhere neutral in the cage and allow him to get used to it, he will eventually get curious enough to explore on his own. Of course I would advise that you speak encouragingly to him throughout the whole process. You should also use these occasions to give millet to your parakeet, or offer him a handful of bird seed, parakeets are intelligent and he will quickly come to associate you and your hand with treats and fun. One of the best random traits of the parakeet is that if you press your finger lengthwise against his lower tummy he will automatically step up onto your finger. 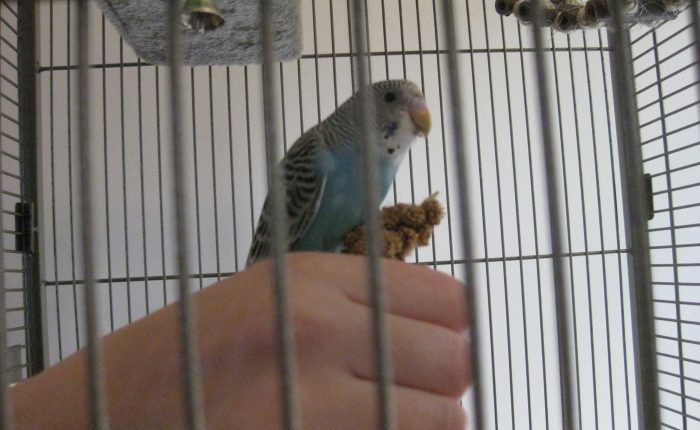 With the parakeet still in his cage, start practicing stepping up to get him used to the mechanics, and he will learn to regard your finger as an safe place to perch. Say “step up” each time you practice, and soon you won’t have to touch him to achieve the desired result, just offer your finger a short hop away and give the verbal command. We worked with Toby inside her cage for about 4 weeks before we felt comfortable trying to take her out and trusted that because she knew who we were, and wasn’t scared of us, we would be able to get her back in the cage on our hands, or bribe her back with millet. This was compounded because unlike a lot of birds available for purchase, it turned out Toby’s wings had never been clipped, and she came home to us fully flighted. If you bring home a bird whose wings have been clipped I would recommend a different approach that involves taking the bird out of the cage after a few days and encouraging him to get used to being gently and respectfully handled (with a lot of treats also). For the first few weeks of living with Toby, every time I came home it was clear she did not recognize me immediately and would react with fear. I would go about my business, chatting with her all along about my day, and then gradually she would realize who I was and become excited to see me. Now, of course, it’s a totally different story, as soon as I get home Toby rushes to greet me and tap her beak against my finger through the cage bars, and then demands to be let out for play. Final note, if you’re attuned to your parakeet’s body language you’ll know when he’s ready to advance to the next step, and soon you’ll be able to take him out of the cage and let him stretch his wings, but be sure to go at his pace, even if it sometimes seems he will always be scared of you, he won’t.